Like most business disciplines, project management relies primarily on past performance to predict future results. With Product Lifecycle Management (PLM) a vast amount of data is collected to help evaluate performance. But project managers still lack useful analysis and forward-looking capabilities to predict and ensure project success. If you are using SOLIDWORKS, adding the 3DEXPERIENCE platform with ENOVIA business applications yields powerful rewards. Sharing product data and information in real-time across the enterprise makes for smarter and faster decisions. Bridging social and structured collaboration generates better ideas and drives innovation. Implementing enterprise-wide engineering processes improves communication and productivity. And, connecting resources, tasks and deliverables through deliverables-based project management identifies risks and accelerates time to market. Selling configured products can drive significant business benefits including increased differentiation and price margins. 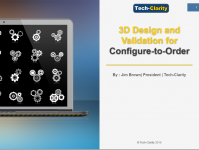 An increasing number of manufacturers offer customization as a strategic weapon, while for others it’s a mandatory fact of life to meet customer needs and ensure products fit into customer sites and scenarios. In either scenario, it’s a highly valuable approach. Midsize manufacturers are poised to grow in today’s vibrant markets. They’re taking advantage of manufacturing revitalization armed with a combination of product innovation and agility. But developing successful products today is a complex business. It requires technical know-how, teamwork, collaboration, and coordination. Midsize companies have to overcome this complexity to compete with larger competitors. They have to connect closely with customers and introduce new products quickly and efficiently to meet their needs. Midsize manufacturers are poised to grow in today’s vibrant markets. They’re taking advantage of manufacturing revitalization armed with a combination of product innovation and agility. But developing successful products today is a complex business. It requires technical know-how, teamwork, collaboration, and coordination. Midsize companies have to overcome this complexity to compete with larger competitors. They have to connect closely with customers and introduce new products quickly and efficiently to meet their needs.